Weeks of extreme heat and drought have baked Welsh fields to a crisp. But amidst the desiccated remains of crops, bizarre circles of green have emerged. While I would like to tell you it’s aliens, it’s definitely not aliens. It’s the remains of ancient settlements emerging from centuries of slumber. These are crop marks, the 21st century’s answer to crop circles. Great Britain as a whole has been facing wild run of heat, with Wales getting the worst of it. The country just had its hottest June on record, according to the U.K. Met Office. The Porthmadog, a small port town in northwest Wales, recorded the hottest June temperature in the United Kingdom when it reached 33 degrees Celsius (91.4 degrees Fahrenheit) on June 28. At the same time, Wales recorded one of its five driest Junes on record, getting just 22 percent of its normal rainfall. It’s no surprise the fields have dried out, but the halos and lines of green in their midst—dubbed crop marks—are a shock. They’re relics of the Iron Age, a period which lasted from roughly 800 B.C. until 50 A.D., showing where forts and settlements once existed. Iron Age settlements in Wales were usually surrounded by ditches that acted as deterrents for would be invaders. Over time, those settlements were abandoned overrun by invading Romans, who effectively ended the Iron Age in the region. Top soil filled them in, making them both more fertile than the surrounding land and able to retain water. When the current drought hit, these relatively wetter, fertile patches of land have helped keep plants nourished even as everything around them dies, according to research by the Royal Commission on the Ancient and Historical Monuments of Wales (RCAHMW), which has been documenting the ghostly reminders of our ancestors. This latest dry, hot spell has provided an exceptional opportunity to view and catalog the sites—some which were already known—from the air. 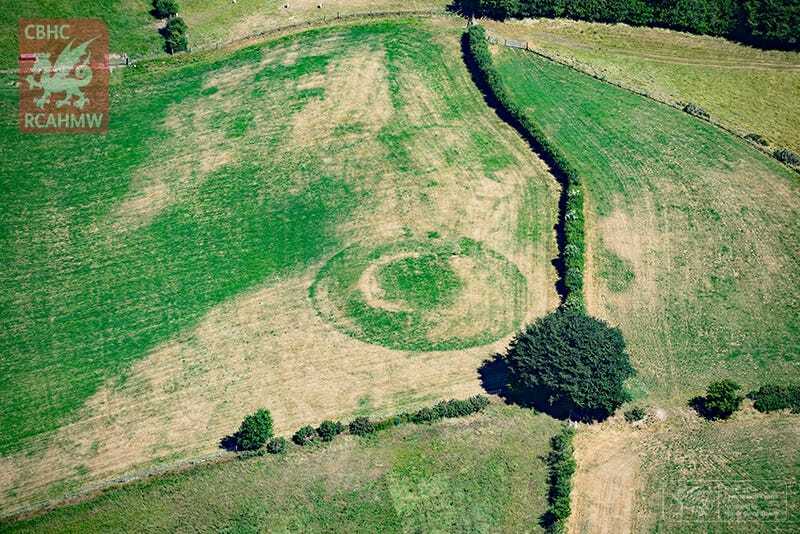 “We have had periods of dry weather in the past, where cropmarks and parching have exposed archaeology, but this current spell is really exceptional both in extent and longevity and the last time it was to this extent was probably back in the 1970s,” Louise Barker, a senior investigator of archeology at RCAHMW, told Earther. It’s a weird juxtaposition of how we used to live and how the way in which we live now is messing with the planet. While no analysis has been done of the current heat wave racking the U.K., research has shown that climate change is almost certainly playing a role in making heat waves around the world more intense and likely to occur. Future projections indicate more of the same: Wales, and indeed all of the U.K. is projected to get hotter and drier in the future, according to projections put together by the Met Office. “Whilst this obviously presents many challenges, one opportunity that arises from this is the discovery of new heritage sites in desiccated grassland and crops which are visible as parch and crop marks,” Barker said. Climate change has afforded weird archeological opportunities elsewhere in the world. Melting glaciers have offered a glimpse of life 6,000 years ago in Norway and thousands of years ago on Alaska’s North Slope, which researchers are now scrambling to excavate. In a more modern twist, NASA climate scientist Ben Cook pointed Earther toward remnants of forgotten towns that appeared after the recent five-year California drought caused reservoirs to drop precipitously. At the same time, a rise in drought conditions is making looting more likely in Mongolia by affecting herding opportunities, showing just one of the many ways climate change will have bizarre, unintended consequences.